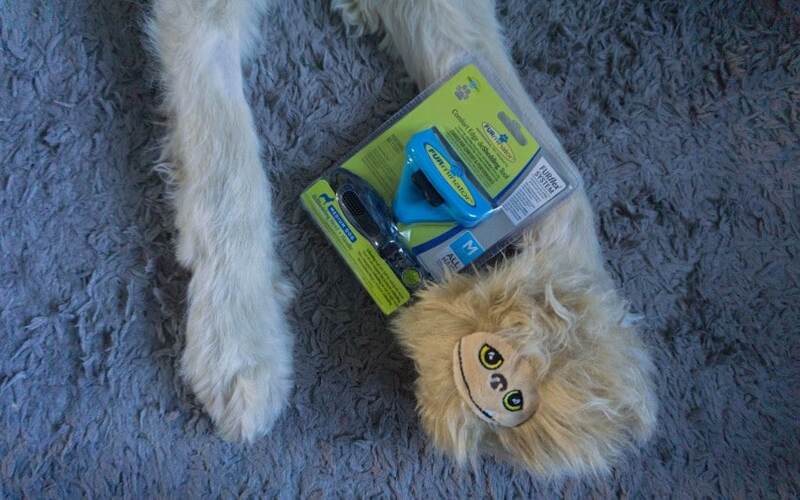 A few weeks ago I featured the FURminator FURflex Pet Grooming Tool on my blog. Gus loves to shred his fur around my house and I have to vacuum so often to try to keep on top of it (usually failing!) Over the past weeks of using this tool I have seen a big reduction in fur being shred around the house, so this is a great tool for us. FURminator has just released a new range of dog grooming products, the FURminator FURflex range. It’s a grooming tool that has interchangeable heads. You can easily swap the heads from de-shedding tool, grooming brush or comb. So all your brushes in one. The biggest bonus to the FURflex range is that you can change the heads to suit each of your household pets in the house. From small to large dogs, and even being able to use it on cats. 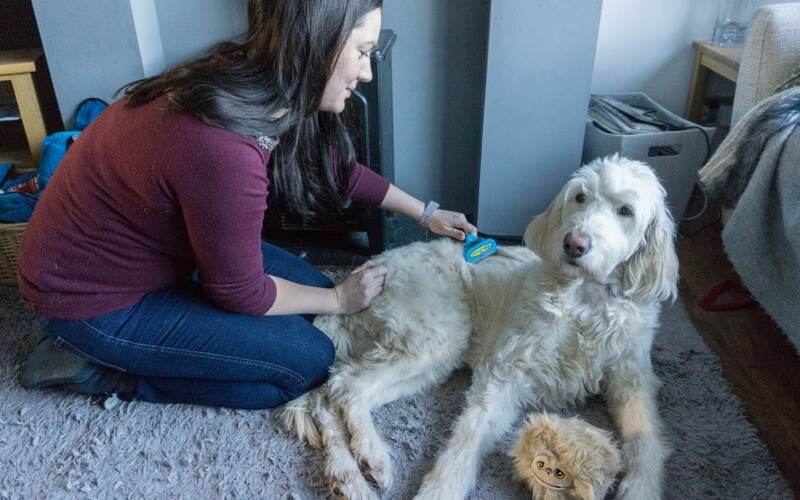 Please take a look at my full review to learn more about the FURminator FURflex range and see how much hair we got out of our dog Gus too! My cat Till would love this! I have 2 cats, one who would really benefit from this! I’d use it on my old cat Poppy who’s 18 1/2 now and not looking after herself properly, she needs help with her fur and I’ve not tried this product which may well be the one that does the trick. My chinchilla persian she’s all knotty! My king charles spaniel. Totally amazing how much fur you picked up! On our long haired dog Tiny. My niece has 3 long-haired Chihauhaus – Pixie, Louie and Charlie. So would give her the lovely prize if I was lucky enough to win. With 3 dogs and 2 cats this would be very useful! It’s suitable for both cats and dogs. I would use it for my Labradoodle Tabs, who at 9 months will need her first cut to remove soem of here little tangles. I have 2 dogs – Zeus and Hugo! Will be using for Bonzo the dog! My ever shedding border collie Max. this would be very useful for our dog jasper who is constantly shedding fur everywhere! Dogs 🙂 we have three and are very used to everything being covered in layers of hair! I’d use it on my basset hounds they love a good grooming ! this is for a dog – a collie who likes to get knotted up! A large hairy dog who sheds like crazy. I shall be using it on my 2 granddogs, Harley and Rafa. I’d use it on a cat. I have Persian cats so always welcome a new tool too try. My Chorkie (Chihuahua/Yorkie Cross) – she has a very scruffy lookimng coat! I’ll be using it on my cavapoodle doggy Pippa to tame her crazy curls! I’d be using it on my tortoise shell cat, Dizzy. She’s only a small cat but from the amount of fur she sheds all year round you’d think I owned a lion! We have 2 Jack Russells named Stitch and Lucky. It will be for our Newfoundland puppy Merrie who sheds SO much hair!! My cat. She is a long haired Norwegian Forest and needs regular grooming. 4 cats and a small dog, it would be divided between them lol. I’d use this for my cat. He’s getting older and struggles to groom his back. I have a dog and 8 cats so I will be using it on all of then (if I win of course)! I have to hoover at least twice a day with my molting golden retriever! If i was to win i would use this on my dog. I would use this on my Labrador, Hector, who is a very hairy beastie…. I would use it on my dog who is a greyhound/saluki cross with very weird fluffy legs which get tangled up every day. I would give it to my Mom for her 3 dogs, that’s a whole lot of grooming! My cats – one short haired and one long. We have 2 cats who shed fur like nobodys business. I would use it for my dog. Would be perfect for our 9 Month Old Cocker Spaniel! I would use it on my two dogs! i would give it to my local animal rescue centre to use on the dogs. My daughter’s dog our cat is so timid we have to spend hours gaining her trust if we approached with this it would set us back years. I will be using it for my dog, Dudley the beagle. I have 3 cats and one with long fur, this would be ideal! I would use it on my dog! I will be getting a pre owned cat from the cat rescue this year and I would love a gadget like the FURminator to pamper my new moggie with. Our long coat chihuahua, Twinkle!